Maes-y-Delyn: Chicken Day- making the most or surplus stock. OK here come’s the usual warning: as this post contains discussions regarding butchery, techniques and some imagery of the preparation of animals for consumption. It’s been a while since we had our last ‘Chicken day’, but it was well over due. So Sunday was Chicken day, probably should be referred to as Chicken D-Day, or rooster D-day as most of them generally are. But I guess we’re focussing on the outcome more than the process itself. A Chicken day has been planned for a while now, it’s just been due to time that we hadn’t committed and set a day aside for it. Don’t get me wrong, an individual bird doesn’t take all day to process. But it does take a little forward planning and it was a good morning’s work. In terms of preparation we pen our birds away for 12-24 hours prior with access to fresh water. Other than the food we coax the birds in with we do not feed them again after this point. Though as our ‘pen’ generally tends to be in the garden, they still get to graze or eat any passing bugs. But the aim is to make gutting etc. as easy and clean a process as possible. *Removal of grit sacks and stomachs can be quite a messy job if they are full. Then on the day we set up our work area. You need to set up an area to undertake the deed itself. We set up our ‘killing cones’ in an area away from site of the pen- the aim is to not stress the birds any more than necessary. Although if you have ever seen chickens around a dead chicken you would have to wonder how much notice or affect it actually has on them. (As they are natural born cannibals!). Anyway our cones are our method. There are others, and I could debate each in terms of whether or not they are humane etc. But at the end of the day you are ending a life and there is no ‘pleasant’ means of doing this. For us it’s a matter of making the process and quick as possible, so not to cause the bird unnecessary stress or pain. The cones present the bird (or its neck) and restrict movement; which is more important after the fact. The actual act involved removing the head in one movement with a sharp knife. This is a technique we have evolved to, over just cutting the throat and bleeding the bird. As it ensures the bird is definitely gone and we are not just hoping and relying a drop in blood pressure to ensure the bird has gone. Once bled we quickly scald the bird to ease the plucking process, this is not ‘necessary’ but it does make it a lot easier. So we set up a keg which is heated using a gas torch. The ideal temperature is 64-74 degrees. And you only want to submerse the feathered areas for 30-40 seconds, so you do not want to cook the meat (agitating also helps). Some also use detergent in the water (to help break down the fat cells). Apparently it also helps with plucking. We’ve never really felt this was necessary. And then you need a clean workspace (preferably with a table/ flat surface (that’s easily washed down) to pluck and gut the carcases. Your tools- I suggest a sharp knife, poultry scissors are great, containers to cool the finished birds in, before transferring to the fridge (and then freezer) and bags or smaller containers for any other parts you intend to keep- offal, feel, necks etc. I would also advise a bin/disposal receptacle (I line a bin with a liner) to collect the feathers and unwanted guts. I have discussed butchering methods of poultry on a number of occasions so I won’t bore you with the details here, but if you want to look them up there’s a few (with variations- different birds/technique’s). On this occasion we were culling our excess roosters- well one Silver Sussex about 1 year old and a few ‘mongrels’, both roosters and hens all roughly 6-7 months old that are surplus to requirements. 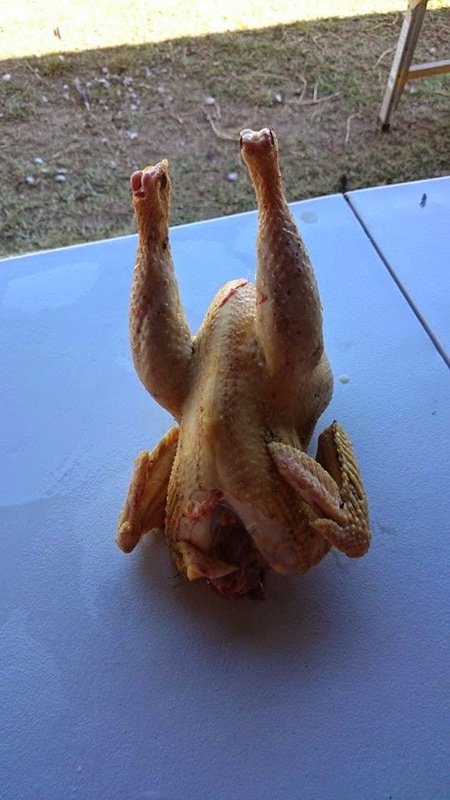 Well generally raise our roosters for the table (at least those that do not sell or are not desirable for our own breeding program); this is a consequence of breeding and rearing, as there is limited demand for roosters. But they fulfil a purpose here. As for the hens, none are laying and most were unintentional hatchlings, courtesy of a cross hen (Old English Game cross layer) that had a habit of disappearing for weeks, to return with a clutch of chicks in tow. Pretty sure they were all an Indian Game cross; some were very distinctively’ Baloo’ (our big blue Indian game rooster). 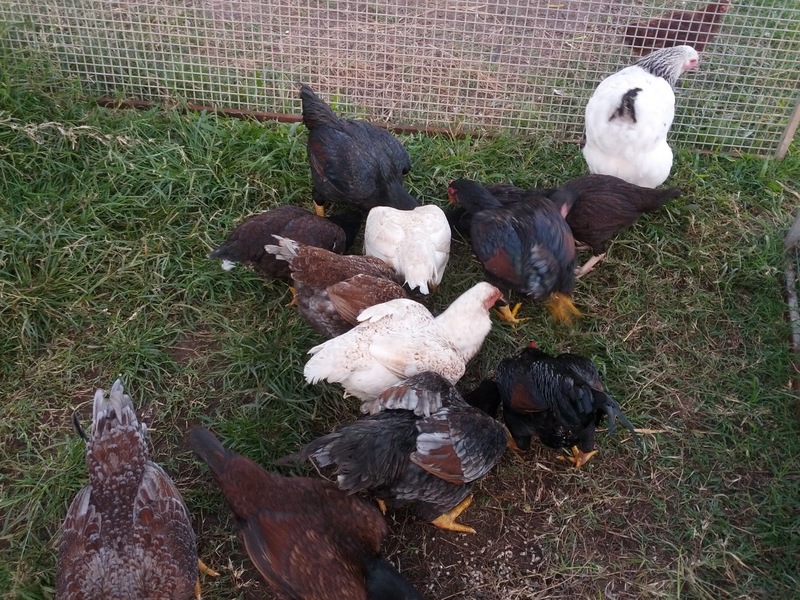 A few others were hatched from our Indian girls, though we also had a young Plymouth Rock rooster running around with them, and these were clearly crosses! We had considered these maybe a promising dual purpose cross. Thinking the males may produce fair sized table birds, and hoped the hens would be more productive than the Indian Games (Cornish). Only we reared 3 roosters! So I guess we’ll only find out the answer to one of the two questions. Culling this variety of breeds (or cross breeds) actually made some interesting observations. The largest bird was the Silver Sussex rooster; dressed out at just over 2.2kg. But given that he was also the oldest (by 5-6 months) this is probably less than surprising. I must admit we wouldn’t normally have a surplus rooster for that length of time. Particularly Sussex as they are pretty aggressive; at least toward each other. Generally as a breed the males will dominate and even kill younger or weaker males from quite a young age. So they can be difficult to grow out together. What was more interesting was the colouring of the flesh- this rooster was the palest. Many people seek this quality in a table bird. I guess it’s mostly aesthetic, or in keeping with the ‘norm’; similar to those found on your supermarket shelves. From our personal experience we prefer the yellower game bird colouring, more along the lines of your ‘corn fed’ birds from the supermarket. Only these are fed grain, they are predominantly grazers. But then our pure Indian Game birds have yellow legs; a feature that greys if the birds are laying, moulting or confined. It was very interesting that not all the birds had yellow legs- although all had Indian Game in them (with the exception of the pure Sussex). And those that did had that stronger yellow to their fat and flesh. Only one of the three Plymouth- Indian crosses had yellow legs, and therefore flesh. This one was also the largest and heaviest of the three. So now we have streamlined our flock back to Pure Sussex and Indian Games (large Cornish), with the exception of our two very old girls- Wellsummer and Rhode Island Red cross that are about 6 years old. 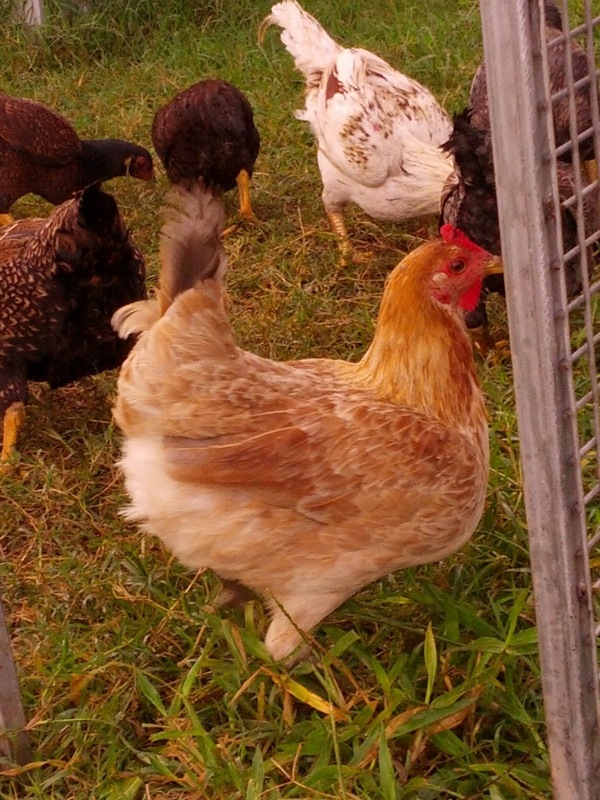 So from a successful ‘Chicken Day’ we have a few good size birds -1.4kg (that largest hen) to 2.2kg. Interestingly the largest Indian game x Old English game rooster was 2kg and he was only 6 months old (this was the one we roasted for dinner). The others were a fair bit smaller; the Indian Game cross Plymouth rocks, two were 1.5 and 1.7kg, but the third was a lot smaller. The smaller birds we processed and joined, bagging cuts accordingly… so many chicken dinners to come! We also keep the heart, kidneys and livers; Whilst I cannot eat liver at present (as I’m 30 weeks pregnant and the high Vitamin A levels are not advised). We will probably make pate from them and freeze it for now. The feet, heads etc. and some other offal (lungs etc) all go to the dogs, either on the day or saved for future feeds… Yes Ffion & Madog are always enthusiastic for ‘Chicken Day’! I do know of those who eat the feet, especially those who participate in ‘yum ca’ and we have used some ourselves in the past. But this isn’t a delicacy either of us are fans of or for stock along with other bones, but as we use other bones and roasted carcasses for this and the feet do feed someone I don’t feel too bad. Even the blood was saved and used. Although not for feeding us (though we do use pigs blood, so I guess it wouldn’t be a stretch). But we captured the blood and used it on the garden. A watered down concoction, combined with worm tea was spread on the freshly planted veggies, as it’s a good source of nitrogen… After all most fertilisers you buy commercially are ‘blood and bone’.